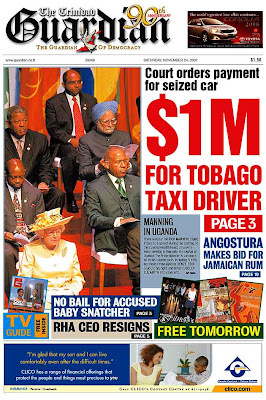 I know Trinidad is a small place, but that never explains how time and time again, too often for coincidence, the Express and the Guardian have the same headline story, no matter what else is happening in the country. Some time ago, there were accusations of a newspaper cartel. Looks to me where there is smoke, there could be fire. Now, there are several more serious happenings in the country, but both newspapers chose to make another kidnap victim. Publishing how much money a man get? Just like they publish the names and addresses of witnesses due to testify in court, and thus painting targets of their backs. Come on, surely the editors and reporters aren't as bad as the dunceys? Wait; they are! By the way, isn't it time the law was changed so that these dunceys start paying for their mistakes out of their own pockets, instead of out of the state coffers? The state continues to pay for the ghastly and costly abuses of power, and the dunceys are rewarded by being promoted. Where is the lesson in that? By not holding them responsible, we simply fuel their mania for abusive and bullying behaviour.